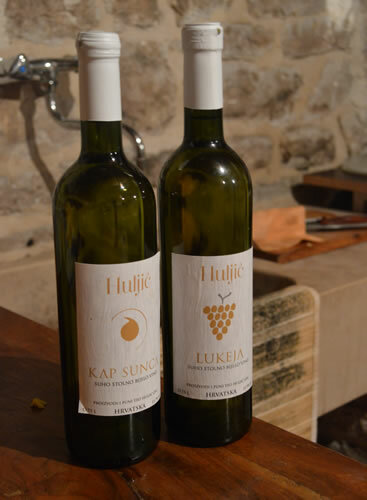 It’s always good to meet Hvar’s winemakers, and we were delighted recently to be introduced to Teo Huljić, and have a chance to sample his wines. 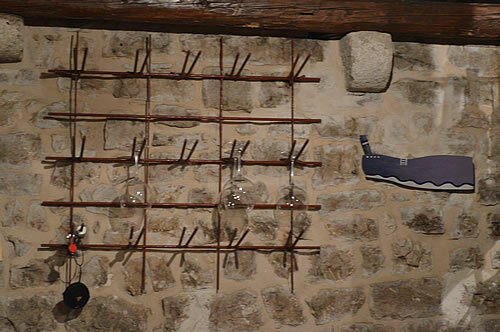 His restaurant and winery are tucked away in the backstreets of Jelsa, just up from the church of Sv Marija and conveniently just around the corner from the Tomić winery tasting room. We were invited to taste his young wines, so everything was drawn straight from the stainless steel tanks. First up was a white – a rather tasty blend of local varietals bogdanuša and parč . The bogdanuša is a lovely light, floral wine, and the addition of parč rounds it out for a more full-bodied character. In this case there was almost a muscat bouquet but a crisp dryness in the mouth. Lovely! The glass rack is a work of art! Moving on to the reds, his next wine was a bordeaux-style blend of cabernet sauvignon and merlot. 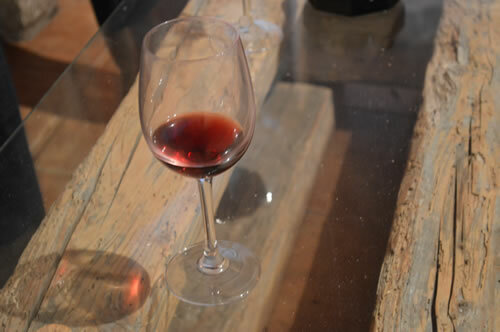 Unusually for a local red, this comes from a vineyard on the north side of the island and the resulting wine tastes slightly aromatic and very smooth. Although still very young, it shows a lot of promise. Our third wine was the plavac mali, which in the hands of Teo Huljić is more refined than your usual big Mediterranean red. He wants to achieve a plavac with clear notes, less of the tannins and so far the signs are good. He’s not so much aiming for strength, he says, but a pleasing balance between alcohol, flavour, and aroma. We had a chance to taste the two most recent vintages, to compare how the flavours are developing. 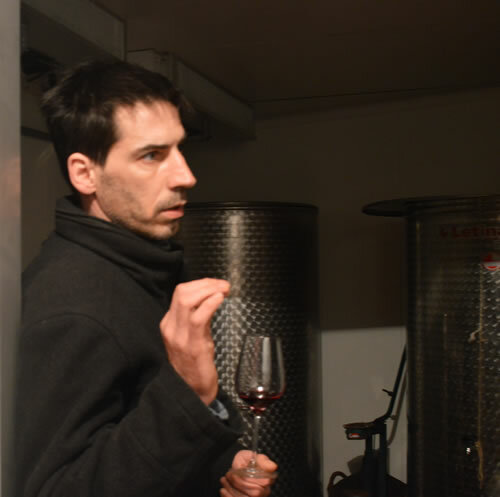 It struck me that creating wine is like making art, and Teo Huljić is a perfectionist in creating his wines with a personal vision. But obviously wine takes considerably longer than a painting to find out how well the final product lives up to the way you originally envisaged it. 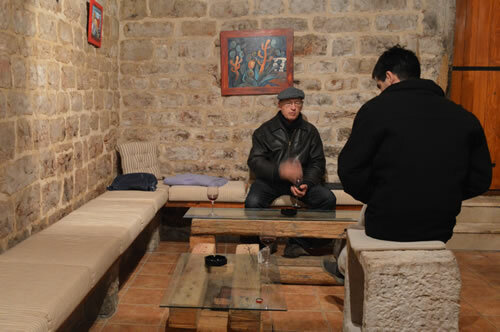 Vinarija Huljić is a small friendly tasting room with some interesting artwork – and even has a dart board! I hear very good things about the food in his restaurant, which was, sadly, not open during winter months. So we’ll have to go back in the spring for the full food and wine pairing! The possibilities for a rather good walking wine tour in Jelsa are looking very encouraging, what with Huljić, Tomić, Duboković and PZ Svirče all having tasting rooms in town!